What’s the Presbyterian Hunger Program doing at the UN global climate summit? 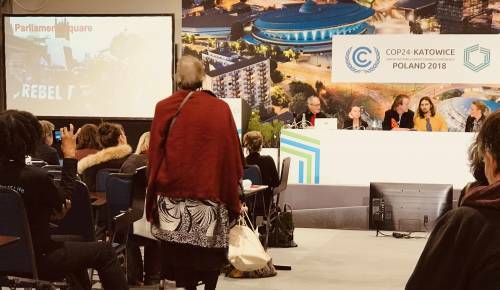 LOUISVILLE — More than 28,000 people have gathered in Katowice, Poland for the 24th United Nations Framework Convention for Climate Change “Conference of the Parties” (COP), and the Presbyterian Church (U.S.A.) is there. Andrew Kang Bartlett, Associate for National Hunger Concerns for the Presbyterian Hunger Program, is on the ground in Poland to advocate for the church, the 23rd time in 24 editions the PC(USA) has had a representative at the summit. Alongside Kang Bartlett are Burkhard Paetzold, World Mission’s regional liaison for Central and Western Europe and Roma, and the Rev. Bill Somplatsky-Jarman, former coordinator of Social Witness Ministries in Compassion, Peace & Justice and a longtime attendee for the PC(USA) at the UN COPs. The PC(USA) is able to participate in these conferences through its accreditation with the United Nations, which is facilitated through the Presbyterian Ministry at the UN. Kang Bartlett says that the goal of COP 24 is to endorse the Paris Rulebook, a legal framework for implementing the 2015 Paris Agreement on controlling climate change. “The Paris Agreement was the biggest advance so far, and it binds the states to keep global temperature growth below 2 degrees Celsius until 2100 and, if possible, below 1.5 degrees Celsius in comparison to pre-industrial levels (1850-1900),” Kang Bartlett writes. “However, this is but a political declaration. Now, you may have heard President Donald Trump intends to pull the United States out of the agreement. PC(USA) policies on climate, energy and the environment have for decades urged principles of good stewardship, sustainability, justice for the poor and our call to be involved in restoring God’s creation. PC(USA) policies have also long included signing international agreements such as the Kyoto Protocol and the Paris Agreement. In 2016, all six agencies of the PC(USA) issued a “Collaborative Agenda for Environmental Stewardship” voicing clear support for measures of environmental stewardship and climate justice. “It is especially important that people from the United States speak with a unified voice, making it clear that we do not agree with our administration’s denial of climate science, and talk of withdrawing from the Paris Agreement,” Kang Bartlett writes in another Food & Faith post. Those comments came in posts before Kang Bartlett left for Poland to attend the conference, which opened Monday and runs through Dec. 10. Since then, Kang Bartlett has posted initial impressions of the summit, including comments from actor and politician Arnold Schwarzenegger and filmmaker David Attenborough, a “Paris Agreement for Dummies” graphic and even tips on how you pronounce Katowice. How? Well, click here. Kang Bartlett will be blogging through the weekend from the Global Climate Summit. Paetzold, also a first-time attendee at the UN COP, is posting here.